The SPS includes four controllable plugs that can be wirelessly turned on or off as well as a plug that is always on. Data including the power of each plug is wirelessly transmitted to a Receiver or Extender. Coupled with a Proximity Tag, up to four plugs can be set to automatically turn off when an individual leaves a room after a certain amount of time and turn back on before the individual returns. An override button, when pressed, will turn all the plugs on regardless of other settings. Optional settings include turning each individual plug on or off, changing the interval between transmissions, assigning Proximity Tags to control plugs, changing the absent interval for Proximity Tags before plugs are changed, and setting a Proximity Tag signal strength filter. By turning off plugs, phantom power from monitors and other equipment in power down mode is eliminated. The SPS is also a Real-Time Location Services (RTLS) node. The Generic Dimmer Controller works with any 0-10 Vdc dimmable drivers to control LEDs. The dimmer transmits data including the power of the lights to a Receiver or Extender. The controller is available in a variety of configurations and installation options including 277 v input. The controller can disconnect power from a driver effectively turning off LEDs. Paired with a Proximity Tag, the controller can dim LEDs to fixed levels when an individual leaves or arrives at a location. An assigned Proximity Tag’s buttons may also be pressed to adjust the lights to preferred levels. The controller can be commanded to dim to a preferred level when lights are initially turned on, assign Proximity Tags with preferred light levels to individuals based on function or role such as housekeeping or security, change the absent interval for tags before dim levels are changed, and group multiple Dimmer Controllers for room dimming. The controllers can be attached to the top of light fixtures and certified for location inside luminaires. Dimmer Controllers act as RTLS nodes. 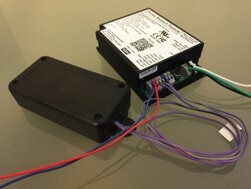 The 12 volt Dimmer Controller has the same functionality as the Generic Dimmer Controller however it is powered by a 12Vdc output from the driver removing any need to connect to a branch circuit. We have certified full functionality with the Thomas Research family of LED drivers. Its 0-10 Vdc signal can be connected to up to three drivers in parallel and allows the LEDs to be dimmed completely off and up to 100%. The dimmer wirelessly transmits data including the power of the lights to a Receiver or Extender. The controller is available in a variety of configurations and installation options. Paired with a Proximity Tag, the controller can dim LEDs to fixed levels when an individual leaves or arrives at a location. An assigned Proximity Tag’s buttons may also be pressed to adjust the lights to preferred levels. The controller can be commanded to dim to a preferred level when lights are initially turned on, assign Proximity Tags with preferred light levels to individuals based on function or role such as housekeeping or security, change the absent interval for tags before dim levels are changed, and group multiple Dimmer Controllers for room dimming. The controllers can be attached to the top of light fixtures and certified for location inside luminaires. Dimmer Controllers act as RTLS nodes. List of tested drivers available. A separate version is available starting October 2017, utilizing Intel’s Atlas Peak 1.0 for additional edge computing capability, blue-tooth device integration and tag options, and remote firmware updates. The Smart Power Plug connects directly into a wall socket and operates like a Smart Power Strip. It includes four controllable plugs that can be wirelessly turned on or off as well as a plug that is always on. Data, including the power of each plug, is wirelessly transmitted to a Receiver or Extender. Coupled with a Proximity Tag, up to four plugs can be set to automatically turn off when an individual leaves a room after a certain amount of time and turn back on before the individual returns. An override button, when pressed, will turn all the plugs on regardless of other settings. Optional settings include turning each individual plug on or off, changing the interval between transmissions, assigning Proximity Tags to control plugs, the absent interval for Proximity Tags before plugs are changed, and a Proximity Tag signal strength filter. By turning off plugs, phantom power from monitors and other equipment in power down mode is eliminated. The SPS is also a Real-Time Location Services (RTLS) node.